My mom and I cook together every Friday evening even though she lives in Birmingham, AL, and I live in Orlando, FL. One of us chooses a recipe, and we send pictures, walk one another through the steps–I had no idea how to cook steak. None.–and then call to talk about how everything turned out. Friday is my favorite day of the week, and this is one of the first recipes we made together. There wasn’t any room for the lettuce. Line cookie sheets with bacon and place in oven. Bake on either side for 6-7 minutes or until crispy. Drain and set aside. Slice tomato into ¼ inch slices. Toss in pepper, sea salt, oregano, and parsley. Place on baking sheet and cook for about 4 minutes on 350 degrees. 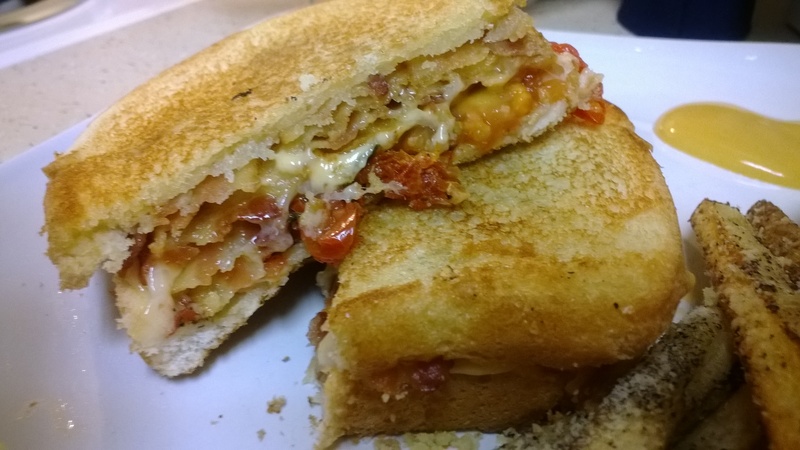 Layer bacon onto two slices of Italian bread and top with one slice each of both cheeses (each sandwich will have two slices of cheese). Layer with tomato slices. Place other slice of bread on top to form sandwich. Heat stovetop to medium-high heat. Add olive oil to a large, nonstick skillet. Place sandwiches into skillet and cook on both sides until lightly brown.